On 27th April 1942, the crew of Lancaster L7572 OF-L from 97 Squadron took off at approx 2020 hrs from RAF Lossiemouth on the North East coast of Scotland to participate in an attack on the German Battleship Tirpitz which was moored at the time in Fættenfjord in Norway. It is known that the aircraft reached the target area during the first phase of the attack on the night of the 27/28th April. Eyewitnesses watched as the aircraft was shot from the sky high above Langstein. The aircraft was totally engulfed in flames and spiralled down to earth. It crashed in the mountains near Kaldåsdammen at the western end of Ausetvatnet, with the loss of all crew onboard. The bodies of all the crew were recovered and are buried in Trondheim (Stavne) Cemetery, Norway. Today, near the spot where the aircraft crashed there is a memorial stone which has the names of all the crewmembers from the Lancaster carved on it. The stone also remembers the crew of Halifax W1020 TL-K from 35 Squadron which crashed nearby on the same night. Evidence of the remains of the aircraft can still be seen today at the site of the crash. A sign made from a piece of wreckage from one of the aircraft points the way to the crash sites. 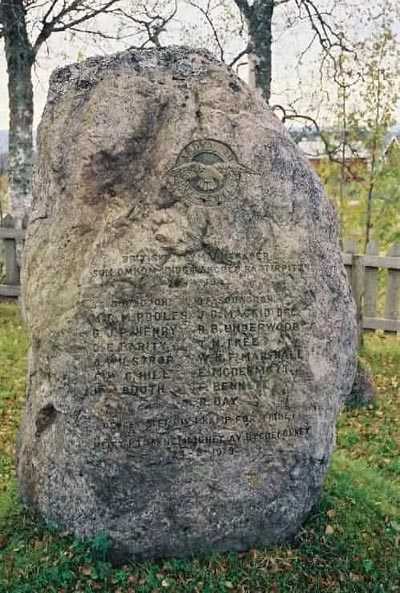 The Memorial Stone in Norway for the airmen from Lancaster L7572 OF-L from 97 Squadron and Halifax W1020 TL-K from 35 Squadron who died on the night of April 27/28th 1942.